Wedding chura, traditionally worn by Punjabi brides now worn by anyone as a fashion item. 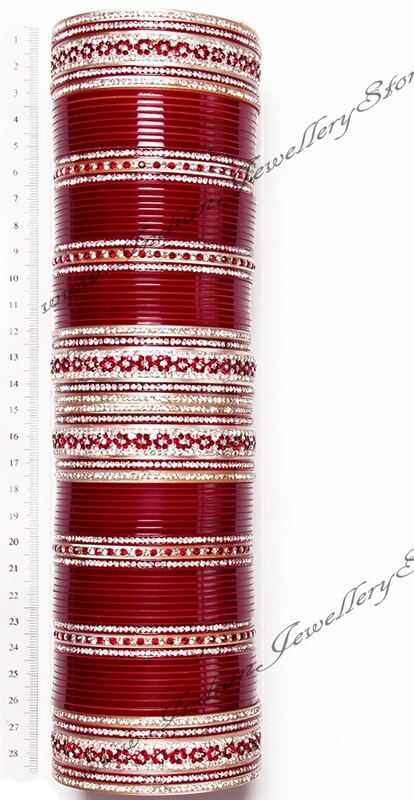 Bangles in cream and maroon red. Set with diamonte stones. 2.4 size, but bridal churas are so big that 2.4 is normally the mid-point (so smaller near hand and larger up arm), so if u are a tight 2.4 then we suggest going up a size for example. We are more than happy to give inner-diameter of your favourite design on request, contact us to enquire. Scale shown in image is in cm.